A rugate filter exploits dielectric interference produced by a continuous variation of the refractive index. This Demonstration simulates a one-line rugate optical filter. 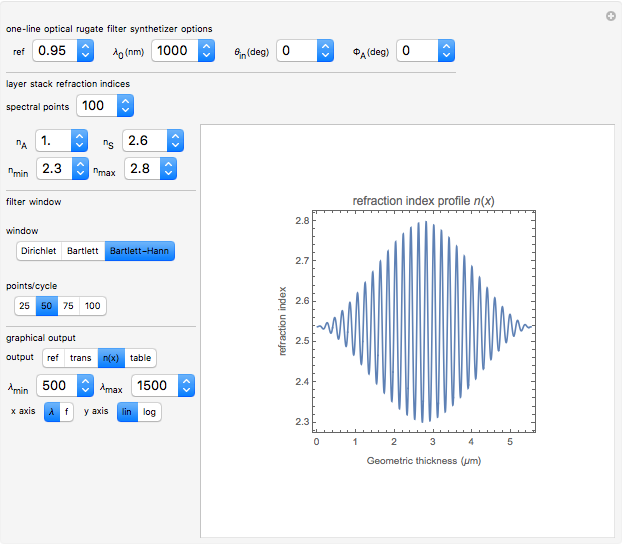 You can select the central wavelength, maximum and minimum refraction indices, and the desired filter reflectance. 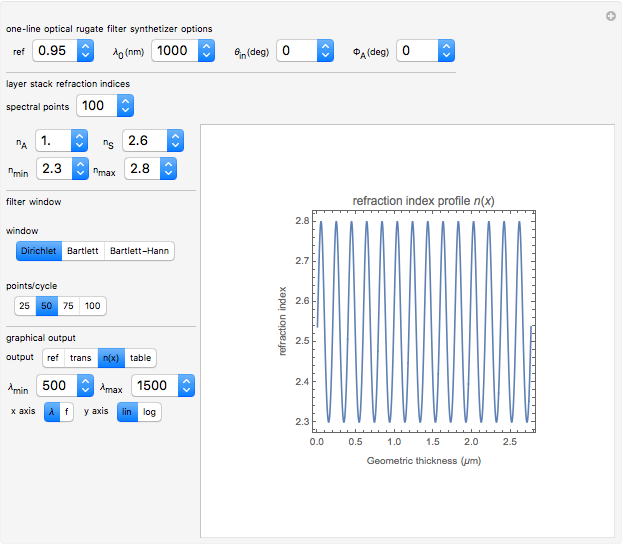 The program calculates the corresponding reflectance profile and filter geometrical length. A material with these properties could be fabricated from crystalline silicon by anodic etching. 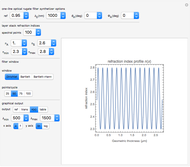 The propagation properties of an optical medium with a sinusoidally varying refraction index are the principle behind so-called rugate filters. 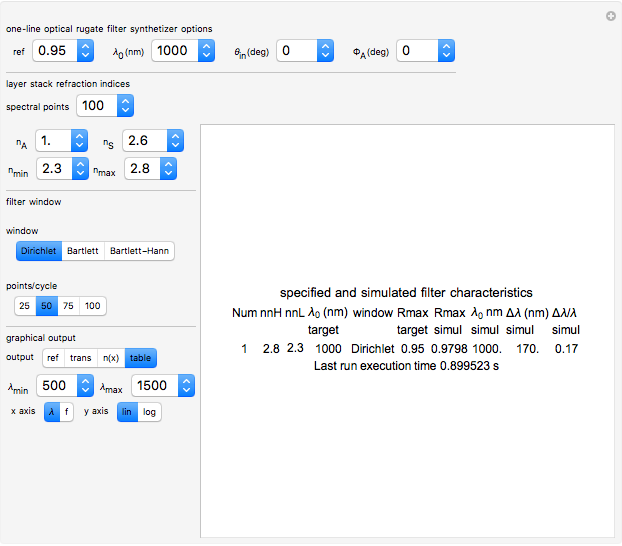 A narrow, one-line rugate filter can be specified with a reflection , usually in the range 0.5–0.99. Light propagation in such a linear medium with position-dependent refraction index is approximated in this Demonstration by subdividing the propagation path into small constant refraction index segments and solved by means of the matrix method . 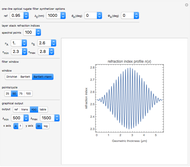 An infinite-length filter is designed with Sossi's Fourier transform method [2,3] and then truncated to a finite length with a Dirichlet window . Bartlett and Bartlett–Hann windows are also included in the program; their purpose is to reduce sidelobe amplitudes. Porous silicon-based rugate filters have been applied, for instance, to the detection of biological substances and chemical vapors . Here is the reflectance and and are the minimum and maximum refraction index values. Similar nonlinear equations are solved numerically for the Bartlett and the Bartlett–Hann windows. Two more truncated were obtained by substituting for with a Bartlett or a Bartlett–Hann window. Here and are the reflectance and transmittance of the dielectric stack. , , and are the dynamical matrices of air, layer ( of them), and the substrate, respectively. They deal with boundary conditions between dielectric layers. calculates the phase change introduced by layer . where , , and are the incidence angles of the impinging radiation of the air, of layer , and of the substrate, respectively; , , and are the dielectric constants of the air, layer , and the substrate. is the phase shift introduced by layer , whose thickness is , and is the wave vector component in the direction of propagation . : Minimum refraction index . If made from silicon, it depends on the etching process. 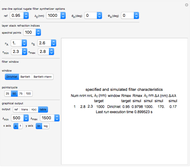 : Maximum refraction index of . If made from silicon, it depends on the etching process. Dirichlet: The originally infinite sinusoidal is cut to a finite length. Bartlett: The sinusoid is smoothly modulated and vanished; it has reduced sidelobes. Bartlett–Hann: The sinusoid is smoothly modulated and vanished; it has reduced sidelobes. P. Yeh, Optical Waves in Layered Media, New York: John Wiley & Sons, 1988. L. Sossi, "On the Theory of the Synthesis of Multilayer Dielectric Light Filters," Eesti NSV Teaduste Akadeemia Toimetised Fuusika Matemaatika, 25, 1976 pp. 171–176. L. Sossi, "A Method for the Design of Multilayer Dielectric Interference Coatings," Eesti NSV Teaduste Akadeemia Toimetised Fuusika Matemaatika, 23, 1974 pp. 229-237. B. G. Bovard, "Rugate Filter Theory: An Overview," Applied Optics, 32(28), 1993 pp. 5427–5442. doi:10.1364/AO.32.005427. A. Kovacs, P. Jonnalagadda, and U. Mescheder, "Optoelectrical Detection System Using Porous Silicon-Based Optical Multilayers," IEEE Sensors Journal, 11(10), 2011. doi:10.1109/JSEN.2011.2119310. Rodolfo Quintero "Synthesis of Rugate Optical Filter"